Lousy consumer spending & the “weather.” Inflation hits Fed target. The US economy surprised economists to the downside once again, a terrible habit it has picked up over the past years. 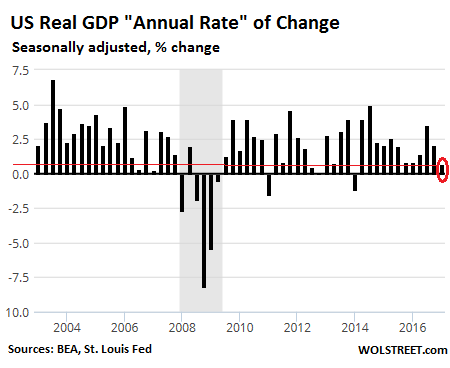 GDP adjusted for inflation inched up only 0.7% “compound annual rate of change.” This means that if the economy keeps growing at this rate for four quarters in a row, economic growth for the entire year would only be 0.7%. By comparison, in 2016, economic growth was 1.6%, matching 2011 for the worst rate since the Financial Crisis. So 0.7% is ugly. It was the weakest growth since Q1 2014. Residential investment jumped 13.7%. Multi-family construction has become part of the historic construction boom in major cities around the country and “crane counting” has become a thing. Business fixed investment jumped 10.4%. This includes the office construction boom that has reached historic proportions (and is part of the “crane counting” thing) and the renewed drilling activity in the oil patch. Trade overall didn’t move the needle much: Exports rose 5.8%, and thus added to GDP, but imports rose by 4.1% from a larger base than exports, and reduced GDP. The net impact of both combined was a wash. The real culprit for the crummy GDP reading? Consumer spending rose, and thus added to GDP, but it was the smallest rise since Q4 2009. Yep, weak sales at auto dealers. It’s not as if this is a surprise to people who read our musings on the auto industry. And the warm weather, which dragged down sales by utilities. There were also some “negative contributions” from business inventory investment and spending by federal, state, and local governments, which fell 1.7%, the biggest drop in four years. But don’t worry, inflation is alive and well, and the Fed sees it too: The price index for gross domestic purchases rose 2.6%. This was up from 2% in Q4. Another measure in the GDP report, the PCE price index increased 2.4% in the quarter, up from 2.0% in Q4. And the PCE index without food and energy – the “core PCE” index which the Fed likes to hang its hat on – rose 2.0%, up from 1.3% in Q4. This core PCE inflation index has now reached the Fed’s target number. Personal income increased, but for the wrong reasons: “The acceleration in personal income primarily reflected an acceleration in government social benefits to persons.” Oh boy…. Disposable personal income adjusted for inflation inched up only 1.0% in the quarter, compared to 2.0% in Q4. So very crummy. Let’s just hope that the boom in multi-family housing and office construction will last forever. How accurate were the forecasts? The New York Fed’s Nowcast, in its most recent forecast on April 21, expected the economy to grow at an annual rate of 2.7% in Q1, compared to the 0.7% the BEA handed us today. So that forecast was way off the mark. Blue Chip “consensus forecast,” cited by the Atlanta Fed’s GDPNow yesterday, was 1.3%, ranging from 0.9% to 2.1%. So too they were off target. The Atlanta Fed’s GDPNow Forecast, last updated yesterday, saw economic growth in Q1 of 0.2% “annual rate” so even worse, but only slightly worse, than the BEA’s “annual rate” of 0.7%. So my hope yesterday “that some internal gears might be jamming up” the GDPNow forecasting model, because of its ugly forecast, did not entirely come true. So kudos to the GDPNow model of the Atlanta Fed, which pretty much nailed it! The difference between 0.7% and 0.2% is a mere one half of one percent. This is a math model rounding error with a conservative +/- factor of 2%. The explanatory excuses used – too warm, too hot, too much, not enough, too hard, too soft, etc. Sound suspiciously like Goldilocks and the three bears! Which is where these stats come from. Fairy tales. After WW 2, the US was the only economy left standing. In fact, humming right along what with the big war, cold war, and post war pent up demand. By the 1970’s the rest of the world had rebuilt shiny new factories and the US was no longer a net exporter of oil. That was one big bubble that deflated and we’ve huffed and puffed furiously over the last 40 years continually inflating bubbles. …. and there you have in a nutshell the very essence of the problem . Our … the American public’s unwillingness to face historical fact [ that from the end of WWII to the late 60’s we were benefiting from a fortuitous moment in history .. not our ‘ greatness ‘ nor American Exceptionalism ] .. and the Politicians with the sole exception of President Carter’s gutless inability to bring the country back to reality before we wind up imploding upon ourselves in our own abject delusions and greed . Suffice it to say had we taken Carter’s advice … choosing reality over myth rather than falling for Reagan’s grandiose bs … we wouldn’t be in the mess we’re in .. and only getting worse under the newest Grifter in Chief . What has actually happened is that the rich have taken the “fat of the land” to other countries and left the bottom 80% of Americans with nothing. While I had hoped for better from him, Trump appears ready to complete the transfer of wealth for his millionaire pals: right now, corporations do not have to pay taxes on foreign income, until they bring it back to the US; thus, Trump wants to forgive any tax on the foreign income of those corporations and also LOWER more the tax rate of the corporations as to ALL taxable income. I guess that the idea that the corporations owned by the rich should pay taxes, like the rest of us, is outrageous. Corporations that invest in China or Vietnam or other countries make more money, because they evade U.S. tax by not bringing their income to the U.S. (They do invest the funds, supposedly held in Ireland or elsewhere, in money funds that in turn invest in the U.S. (and other countries), which is why the claim of Trump that there will be an economic boom if the rich are just forgiven their corporate taxes is a load of baloney– to be polite.) While the GDP has some bizare calculations, e.g., medical expenses from treatment increase it, so an Ebola epidemic might increase some of the GDP, it accurately reflects the fact that under current law, millionaires are rewarded for evading U.S. taxation and investing their money in foreign countries. Already, corporations enable the rich to deduct all of their homes, vehicles, planes, and most personal expenses. Lowering corporate tax rates is giving more welfare to the rich that get U.S. government gifts: e.g., for the F35 disaster. Banksters and others thus depend on the U.S. to bail them out from risky investments, while they avoid paying U.S. taxes. That probably is why Trump is desperately refusing to disclose his tax returns: like other millionaires, he has not paid taxes for years. In other words, the rich are investing in foreign countries and without U.S. based manufacturing increasing, the GDP does not increase, despite modest increases in services. As U.S. consumers become poorer, due to the transfer of their high paying jobs to foreign countries as discussed above, they spend less and the GDP then does not increase or decreases. I predict we will see future GDP increases. In future, GDP will increase due to concealed inflation: the banks have so much money that they are not lending out and are holding in the banking cartel called the “Federal” Reserve that when some of that money is released to the general economy, we will see hyperinflation like Weimar Germany. They will try more numbers tricks to miscount it and understate it, but we will see it in our every day expenses– despite our great-depression type U.S. economy. You cannot increase the money supply like the “Federal” Reserve bankster cartel has increased it without consequences, ultimately, if the money filters to the general economy. The Banksters’ Yellen is like a little Dutch boy with his finger on the hole in the dyke. I wonder what will happen when her finger slips out. I keep waiting for Americans to be outraged and take action. I am amazed at how much the banksters (and millionaires that control the banks) can do to Americans while suffering no retaliation: your pension funds, savings, and future have been destroyed. Wake up! What “wealth”? This nation is dead broke. Your are throwing the words tax evasion at US corporates with out foundation. Under US law those earnings are not tax due until the funds are repatriated into the US tax system and thats how it should be. What is wrong is the US pursuit of personal OffshoreEarnings inconsistent with the way the US treats companies. And the insanity of making US citicens not resident in the US.P Pay tax on earnings outside the US that are also not repatriate to the US in that tax year. Without even giving them a concession for the tax already paid in the state where the earnings were made. The US is the only nation I know of that has this insane personal tax policy. The US either has to start treating companies how it treats people, or treating people how it treats companies, in regard to offshore earnings. As among other things, the current policy is inconsistent with the “Citicens united” legislation. Currently Companies/Corporates have it both ways this should not be so. As Wolf explained, they’re not actually different. 0.7% is measured compounded, while 0.2% isn’t. The results are the same, just measured differently. there is often truth in fairy tales………. Fairy tales can transition into allegories. Alice tumbled down and soon learned many truths. When will Wall Street take the red pill? Reality in wonderland is getting closer by the day. Not sure how much longer the wizard can keep the controls in check. Who will pull back the curtain? Trump, maybe? I live in Bellevue, WA. The Mayor and City Council like to remind us residents that our city is the envy of the world. Lots of building and transportation projects everywhere. I’m also noticing a sudden growth spurt in the number of “For Lease” signs on commercial and retail sites. The Sport Authority in downtown closed last July and is still for lease. The Pier One site, also in downtown, closed February 2015 and is also for lease… empty for 14 long months and counting. These locations are among the very best in the state. A more disturbing trend i am noticing is the number of smaller and older Medical and Dental office buildings that are situated a few blocks outside downtown that have for lease signs. Almost every other building has a Colliers or a CBRE Panel posted out front. Maybe i am unintentionally exaggerating, or am over reading the signs (pardon the pun). It could be that they are all upgrading and relocating to newer developments that have sprouted up, but I also think that could be an early symptom of some disruption in the Healthcare Industry. The CRE is a toast with the closing of all Mom n Pop stores along with malls shutting down. The writing on the wall is very clear.. Amazon and alike would eat all of them. The question is:: what would happen to livelihood of these millions of people ? USA GDP is driven 70% by consumer spending. If the consumers don’t have good jobs, how can they spend ? Same thing for real estate.. If the real estate and rents are so expensive along with insurance, how can they spend on discretionary items ? I see bad omen for the future…. I’m in San Jose, California, an area that’s supposedly blessed by Techbro God or something… There are “Available” signs all over the place, and I was playing my trumpet in front of a big empty restaurant in one of the “better” parts of downtown the other day. Since paying my taxes has cleaned me out (I still owe about $450) I’m spending very very little. I’m hoping the weather stays cool because I’ve been putting off buying another pair of shorts, for instance. I’m not buying beer, not spending the $16 round trip to go out to Santa Cruz where I’d normally spend about $20 anyway, on a nice lunch etc. There’s a nice Ross that just opened near me and I’m not buying stuff there. Anything discretionary is at full stop right now, and in a month when I can spend more freely, it’s going to be a lot less than before, because I don’t want to get caught like this again. Now imagine a whole country like this. In fact, in my experience there’s a little surge in buying when those fortunate enough to have “real” jobs get their tax returns done and get their refund. It’s easy when you’ve just got a W-2, and it literally only takes a few minutes online. But a huge number of people are like myself. We have 1099’s, and have to go our taxes like we’re a small business, using the 1040 and a few other forms, and have to pay, not get money back. So we scale way back in spending for the next month or three. News flash ! The whole country is like this, with few exceptions. That is one of the points of this article and many that Wolf as published (or should I say been screaming about for ages). Look folks, everyone …from the dumbest to the smartest knows exactly what is wrong and likely why. Two years ago it looked like MAY BE something was turning. Nope, fadeout, status quo. Everything appears to be getting painted into a corner, and we go skipping alone holding our noses and gazing skyward ( or into he phancypone) like we are blind to the warships sitting in the harbor. Our world as we knew it is under attack, and the outcome is not going to be a better world. There you go, everyone knows what is wrong. Sadly, no one is going to do anything about it. As for taxes, taxes are for the little people, that is the score. I have to count on saving $200 each month toward taxes at the end of the year or April 15th, somewhere in that window, for taxes. I actually feel fortunate in being able to get by on so little. Here in the old rust belt city the housing stock continues to deteriorate. You can see the blight moving out from the worst hit areas just by watching the advance of the deteriorating roofs. The cost of a roof here is now $10,000 to $20,000 or even more with a big 2nd story roof with a lot of angles and most of these houses have a resale value that isn’t much more than that. Half of the houses here are at the uneconomical to repair point. That is a sad tale, but with little industry and employment in the area, I guess it is inevitable. Add in lead paint, underground tank leakage and asbestos insulation and you end up with negative property values. In such cases, it would be no surprise to see owners walking away. They’d drive away but their cars got disabled by the sub-prime auto lenders when they missed payments. The rust belt story is overstated at times but this we know…… It’s happens historically. Todays silicon valley is tomorrows rust belt. It’s just the way the world works. San Pedro Square is a place downtown San Jose is proud of, lots of neat little restaurants and lots of people go there, especially when they’re going to some event at SAP Center, like to watch the Sharks get pasted by the Oilers (hehe). But there are empty places there; the other night I played my trumpet in front of a big closed restaurant there. But last night another trumpet player was there, so I played in front of the Starbucks on the corner that closes at 9. I can’t imagine a Starbucks especially downtown closing at 9, but it has to be because there’s simply no money to be made after the locals are done with work, no longer need say an 8PM coffee and ham croissant after work or in preparation for some late work. What is interesting is that U.S. household wealth is above $93 trillion. It has increase from $54 trillion in 2009. In theory every U.S. citizen has $290k. The average family size is 3.1. So that means every U.S. household has a net worth of $1 million. Only if wealth were evenly distributed. The top 1% of Americans own roughly 40% of the total private wealth in the country. I’m fairly convinced that the true number is well north of 50% if you were to account for assets hidden offshore, but I digress. If you’re outside the top 10% of Americans, there’s a fairly good chance you don’t have ANY net wealth when you account for debt. Nothing. Zero. Zilch. Nada. Nil. The bottom 25% of Americans have a negative net worth, and there’s a large percentage of Americans who are at the margins. It is, without a doubt, one of the biggest problems in our system and society today. But you try to have an honest conversation about it and you get shouted down as a Marxist by well-trained plebes who would rather cut their nose to spite their face. I completely agree with you. I think Bernie Sanders was the only candidate on either political side that used the word “poverty” in his campaign, – and to me at least – seemed the most honest individual who ran. However, almost all political endorsements went to Hillary. NYTimes blacked out Mr. Sanders. I gave money and made phone calls for Bernie Sanders. We were sandbagged by the DNC. Instead of an intelligent and compassionate human being for a leader, we have a clueless alt-right, orange golfing clown occuping the White House. Is it any wonder that we don’t want to spend our money when we are depressed about our future and the future of the planet. I still have the “Bernie F*ckin’ Sanders” sticker on the rear window of my pickup. Tough to get the backing of banks and big entities, such as the NY Times, when you advocate targeting their source of income. Just keep it, “Blah” (e.g. “Stronger Toboggan”) as HRC did, and the funders remain happy. HRC and the Demo’s lost on two issues, and two issues alone: abortion, and gun control. Bernie Sandes sold his soul to Hillary because they had something on him. The Federal gov!t are now investigating Mrs. Saunders because she basically stole money from the college in Vermont that she worked at and left in terrible financial condition. Now that Hillary isn’t in charge Saunders have no protection. And by the way Bernice just purchased his THIRD million dollar home, ain’t socialism just great ! And if you think it’s greAt all you have to do is look at Venezuela! The man with 3 million dollar homes!!! This. The guy I work for honestly has a net worth of a million. He’s got the financial acumen of a 13-year-old, has done a bankruptcy, and they only have two nickels to rub together on a day-to-day basis because of this Ebay thing he hires me for and the inheritance his wife got, but if you tallied up his wealth, it really is about a million. He has just about zero job security, and it’s funny because he hires me as a 1099 while he’s a 1099 himself for the place he works for. His wife shops at discount grocery stores and they do all the house repairs and car repairs they can themselves. Fortunately, the guy’s pretty handy. So while he might be in the top 10% he’s not “rich” by any means. Really, it just means he gets to go to a slightly less crappy nursing home when he’s old and in the meantime he’s got to paddle like crazy to support all his stuff. You have to remember, there are….what….fifty people in the USA, whose combined newt worth is more than the net worth of the bottom 50% of the USA population, aggregated. Take out the “One Percent” households, and see what “every household” has as net worth. I believe the story that a large proportion of households in the USA cannot scrape together $500 from their assets, in the case of an emergency (e.g., flat tire requires all new tires, etc). That’s directly attributable to those same people paying massively inflated prices for housing. But you’re right…. it’s not going to end well. hopefully this isn’t a “dumb” question , but here goes anyways to wit :in regard to the following data points ” annual rate” of GDP change came in at 0.2%”. Does this number represent the increase in real GDP over Q1 of 2016 ? thanks . Smingles pretty much answered your question below (but perhaps forgot to do it as a “reply” to your comment). Let me give you my 2 cents worth here. First, the way I wrote this was confusing in the original version. I have now rewritten it. Second, as Smingles pointed out, not a dumb question at all. The rate generally reported is just one of the many numbers the BEA produces concerning GDP. GDP is measured in dollars (nominal GDP). It’s then adjusted for seasonal variations. That quarter’s number is then extrapolated to an annual rate, which in Q1 was $19.0 trillion (what nominal GDP would be at this rate for the whole year). – Change over the past 4 quarters = 1.9% growth (which includes the data from the stronger quarters last year). – Not annualized, Q1 from the prior quarter = 0.17% (rounded 0.2%). – “Compounded Annual Rate of Change” = 0.7% which is the headline rate in the report and the first rate I mentioned. It extrapolates the 0.17% to the entire year (0.17×4). It does NOT include the data of past quarters, but is extrapolated forward to the whole year 2017.
thanks , I misread the chart. i thought the Q1-2017 bar was sitting at .2 percent(quarterly) and was not accurately representing annualized data . I did not realize each bar represented that quarters increase over the previous quarter annualized. In any event i can’t see how the GOP’s biggest tax cut in history can generate enough additional revenue to cover the accompanying increase in the deficit. The center for a responsible budget says The cost of the tax proposal is 5.5 trilion over 10 years and not a help to economy. So now, the baseline debt increase from CBO is 10 tril over 10 years and the CBO using 2.5% growth,. Add in 5.5 for tax plan, another 3 for infrastructure, and 2 more since CBO inderstates and deficit increases 20 trillion the next 10 years. Then the variance between stated deficit and cash flow. Thats averaged 700 billion the last two years, and is 7.6 trillion since 1983. Thats money spent but not accounted for. Add big bucks each year for the next 10 years and the debt could increase by 30 or 40 trillion as this goes exponential. It will not go that far.too many problems overshadow economic and financial. Internal social and political and geopolitical. The number represents the quarterly change in GDP from Q4 2016 to the end of Q1 2017, seasonally adjusted (different quarters have different numbers of days) and annualized (pretty close to just multiplied by 4). So it has nothing to do with Q1 2016. So you could think of the Q1 GDP as basically 0.05% higher than the end of Q4 2016. Annualizing it makes it 0.2%. Basically what the number would be if Q1 was repeated throughout the rest of the year (although it ignores compounding, pretty minor difference with numbers this small though). That being said, the quarterly numbers tend to be pretty noisy. I do have to laugh at the warm weather excuse, though. If the winter is cold, people spend more on heating/utilities, and less on discretionary goods, and that is blamed for weak growth. If the weather is warm, people spend less on heating/utilities, and that is blamed… but wouldn’t they be spending more on discretionary if they had extra money? It’s a tails you win, heads I lose argument– in other words, it’s totally bunk. “in other words, it’s totally bunk”. “Tomorrow will be wonderful, that is, unless it is indescribably terrible, or unless indeed there just isn’t any”. Surely these numbers are so low it is a recession? “Growth” is fiddling the numbers but even from here, in Oz, we read about all the RE signs proliferating, mall closures, restaurants struggling, etc, showing how strapped spending is for millions burdened by serving the financial world’s induced debts. Does I really matter. ? The real estate/stock asset class prices have been detached from fundamentals for long time…. Yes, the detachment of real estate, and most publicly-traded companies, are very much detached from the economy for many years. Wolf has pointed this out, but it’s difficult to explain in simple terms to your neighbors or the guy next to you waiting for a bus. That is why it is not persistently unearth on “Financial News” It cannot be summerized in a keep phrase. A good image would be the soldiers who managed to fly out of Stalingrad and were safe (USA’s 1%), while the rest of us (99%) were left to die by artillery, or be captured and die from poor attention (over 95%). Mnuchin back in Berlin, proclaiming his plan is “good”. The trend is toward more urban practices that are corporate owned or at least a mega-group so that call is not more that a couple of times per month. This has been the trend for years, and seems to be gathering steam. This will mean even more regionalization of care, and most medical centers will be in ever fewer but larger cities…that is fewer towns and smaller cities. Not only that but even in large cities, the practices are moving to the more affluent suburbs and the blue collar areas will feel the pinch. I also wonder how the abundantly growing supply of Immediate Clinics and Urgent Care clinics that are sprouting up in CVS’s, Walgreens and Strip malls all over the place, will impact the traditinoal private practitioners operating out of the abundant supply of older Medical buildings that populate medium and large sized cities. My friend bought a house with 3 bedrooms and wrap-around porch in small-town south-central Nebraska for $12,500. There isn’t any reason people who work from home need to be paying 100x that amount to be on the coast. Wow! 12,500?? Missing a zero? Even at 100x that, here in LA, 1.2m will get you a crap shack – it may have 3 bedrooms, but it is falling apart and hasn’t been updated since 1940s or it’s in an “up and coming” neighborhood. The problem is – there are no jobs in Nebraska. Sure, you can buy a house cheap, complete with a brutal winter, tornadoes, and miles and miles of nothin’ but miles and miles, but what do you do for an income? I agree. Unless you’re retired and don’t need to earn an income, it’s worse to be someplace with no jobs than elsewhere where there are plentiful jobs, even if you struggle with expenses some or have to reduce your lifestyle a lot to make your income work. I know there is a lot of talk about being able to work from anywhere, telecommuting and other stuff, but I know my work will only let some highly valued people work remotely out of state, and only temporarily. I think one employee has been able to work from Chicago because his partner moved there for school for 2 years but it’s not a permanent relocation. For many companies, if they’re going to give up the benefits of direct face to face communication, quick collaborative work and a highly skilled workforce, then outsourcing to India is even cheaper than even the cheapest parts of the US. Or if they want many of the benefits of local employees with a cheaper price tag, then H1B visa holders have become the trending cost cutting solution for some because they can threaten to stop sponsoring them if they don’t like being paid 20-40% less than their American counterparts. The visas are supposed to be for skills unavailable in the US working populating, but they find ways to manipulate postings and other things to show the results they want and get cheaper labor. Easy. You may have to travel some, but there is a HUUUUGE demand for “Crane Counters” these days. Haven’t you heard? So when is the next Fed rate increase? Yellen will pull her patented “Lucy and the football” routine of punting on yet another interest rate hike, wait and see. Bilking savers out of interest income is too lucrative a racket for the Fed to start “normalizing” rates. Things have changed. They’re on a mission. Watch them. They’re going to say it’s just a typical first-quarter slowdown. As long as markets take it in stride, they’ll raise, and they’ll start unwinding QE too later this year. But all bets are off if the stock or bond markets crash. Yes, the Fed is managing the stock market, but they also have to keep an eye on the national debt servicing costs, and that is the ‘runaway train’ wreck on the horizon. With a completely static economy and a debt to GDP ratio of 105% currently, and soon projected to be 150% (a decade or so according to the CBO), any significant increase in what the Treasury has to pay out in interest on financing Uncle Sam’s debt will be catastrophic. How do we even know what the real numbers are? The GDP comes in at annualized .7, to which you add back 2.2 for PCE to get nominal 2.7 incl inflation, but Shad Stats and Chapwood report inflation is 10% so then real GDP is minus 7.3%. Obama clearly said our defict was 597 billion for fye 16, but debt spending goes uo 1.3 trillion and GAO confirms it. How do we know the Fed is not expnding money supply back doors. If the Fed wants, it can print a billion and buy spx futures and that is buying 10 billion of stock. Thats how they turned around the 1987 crash. Anytime they want they do it in larger scale. GAO in its report this year said HUDs books fubar. 50 billion of budget and 514 billion of accounting errors. You need to read the GAO report to really understand that nothing is real. Who in media talks about that. Not 60 minutes. Wolf…for years I have heard…” just wait until the bond markets takes away the punchbowl”. Who in their right mind would buy bonds at 1.7 to 2.8 with up to 30 years terms, with inflation over 6% in real terms? If you are willing to live in the sticks, housing becomes much more affordable. My guess is that will become a path to retirement for a lot of the middle class. I moved to the “sticks” (Boise, Idaho) from the Bay Area in 2004 on a middle-class income. My husband and I are retired at 45 and we largely stayed out of the stock market after 2008. Can be done if you are willing to keep lifestyle inflation at bay. Both of us drive cars that are over 15 years old. We live frugally, but sleep well at night. 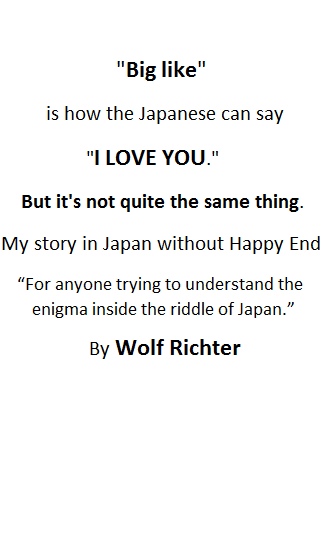 Hi Wolf and intelligent readers. Something I’ve wondered (and worried) about is how inflation on food prices will play out in the coming years. I see that it is often left out of inflation estimates. What is everyone’s thoughts on where food prices are going? Is it a sound investment to buy and store food for the longer term anticipating large rises in prices in the future? I got a lot of push back a couple of months ago when I commented that our food bill had doubled in the last couple of years. It has definitely doubled and we rarely eat anything fancy. I’ve posted before: why don’t you grow your own? Easy to do for vegetables and a way to get cheap, wholesome food…………..more difficult for fruit. A huge return on your ‘investment’, tax free, and healthy for you. We had a bad year here in Oz, but we are still eating fresh fruit everyday. We’ll run out of apples this week. I could care less how cheap they are in the store as I know there have been no pesticides or chemicals used on my apples. Next up are oranges (really bad this year and we’ll be lucky to get a couple dozen – a waste of time and water for that) and then mandarins which we can leave on the tree and eat for weeks – looks like a huge crop this year. After that the ‘winter’ spuds and spinach will be ready to harvest. You can grow spuds here almost all year long. The only thing you have to watch out for is an early frost. And what about fishing where you live? Can’t you get a fishing license and go catch some fish? That is next on my list to do when I qualify for a ‘free’ fishing license………..based on my previous great success in that area so far in Oz paying for one would be a waste of money!!! Best thing about that is as a result of reduction in commercial fishing in the bay, fish stocks are way up and I may actually catch something!!! I know you are trying to be helpful, but I am at heart a city girl, New York City to be precise. I am much more comfortable hijacking a Publix truck than keeping a garden. You can take the girl out of NYC, but you can’t take NYC out of the girl. Sorry. Here in California, if you shop right, food is cheap for very good quality, if you are willing to shop (1) produce only stores (2) drive once a week to those stores. You mention “spuds” growing all year round…I could harvest the 100-lb of spuds I have in a box, but it isn’t worth my “retired” time to do it. Price of spuds has barely moved in TEN years. $1/lb self-picked, and much less by 5-lb bag. Rents have more than doubled around here in 3 years. 2-bdrm apartments at $3500-$4000/month. Collusion by property-owner association meetings. Trading info. Fwiw, I’ve seen my food bills and overall prices going up significantly over the last 3-5 years or so. I put it down to the fact of real estate going up a huge amount here and also the fact that the dominant player here (Safeway) was part of the merger and acquisitions bonanza from all the extra low interest money sloshing around. So why not try to go some extra steps toward either buying and flipping or monopoly with all that free money? Food prices definitely went up, and in some cases roughly doubled. You might still be somewhat in luck if you live in the US, and not suffer from falling exchange rate. But do not worry; it is all fixed, and won’t see it the consumer inflation. Once again, a de minimus way of coping with the macro situation: In the countryside, much of one’s food can be produced at home. Lotta work to remove that lawn. Lotta work to get it planted. Lotta reasons farms have to be big. It might be easier to get minimum wage working for someone, tearing out landscaping. and buying what you could -possibly- grow, on those wages. Ever tried to grow cauliflower and broccoli? We stretch our food budget by shopping at dollar stores. There are many items that are identical to ones in conventional grocery stores, only much less expensive. The produce items need to be eaten soon as they are closer to toss-out or recycle dates. Those dollar stores may buy what has a shorter shelf life than acceptable at grocery stores. Watch the expiration dates and shop carefully. There are also many other bargains to be had, from soaps and shampoos to household items. I have heard that big banks are buying up water rights. Climatologists have been saying we are just entering a mini ice age which will lead to food shortages. There will be erratic weather patterns like in Spain last month that wiped put lettuce and spinach. Also too much rain in the northwest produced decrease in vegetable production. Farmers are barely making it and how many will be left after the financial crash. Also foreign countries are producing agricultural products here and shipping back home. After the crash you won’t have the reliability of huge transports of goods at long distances. It will be regional goods and services. Many are telling people to grow their own gardens. Also radiation from Japan is killing seafood in Pacific Northwest and harming Apple crops. The radiation crosses the U.S via Ohio Valley. Do we really know what we are eating. Another way to ‘control’ people is to limit what they can do in their yards. Don’t know about the USA, but here in my little part of Oz you used to be able to keep a large number of chooks (chickens to you Yanks) in the backyard. Now IIRC the limit where I live is two. No roosters either. Bee hives? They have some ridiculous rules about space and distance from fences and given the stinky little yard sizes here now many of which are even smaller than in Japan, you can’t keep bees – not that many people would even know how to anyway. With what they call ‘big blocks’ (yeah right) of 800 square meters (1/5th of an acre or 8000 square feet) being cut up and having two or three townhouses put on them it doesn’t leave much room for a garden and many of those don’t have enough sunshine either. Finally, if you keep pushing up the cost of inputs such as water, it makes it more costly to grow your own if you need those inputs. Retail price is rising but margins are not keeping pace. The big chains as they can buy cheap and sell with a huge margin. And the producer with its own outlet, as they cut out all the middlemen (Including Carters'” and make a lot of cash disappear each day. Also all their vehicles are owned by the production entity, or the outlet. They also mostly produce more than the their store can sell, which gets sold to other small outlets or chains. First NBC Bank in New Orleans just failed. I haven’t seen a bank failure in a while. Another not so good indicator. I remember during the (ahem) “last financial crisis” when I’d log onto the FDIC’s Failed Banks List on a daily basis. Somewhat for entertainment, but also hoping that the smaller regional bank and credit union I deal with weren’t on the list. I may have to start revisiting those pages………. One of the “hazards” of taking personal responsibility for our behavior – financially or in any other field of human activity – is that decent folks inevitably bear the cost of cleaning up the mess left by miscreants, one way or another. I guess we’re stick with believing virtue is its own reward. Actually it means the Fed’s plan is working and some big bank will gobble up the customers. Does Uncle Warren know about this? The reason? A combination of low inflation, low rates of productivity growth, and slow population growth may imply an economy “where equilibrium short-term interest rates remain relatively low” by historical standards. The translation: it is your fault, nothing to do with us. So if I understand it, the previous two thousand year when the lenders charged the borrowers there was non-structural economy, and now in the past ten years we have structurally changed economy. It’s funny very few bloggers have seemed to notice Capital One credit card charge offs have surged. Isn’t that the true canary in the coal mine? Running the following query on DuckDuckGo (My search engine of choice because it does not track its users): “capital one credit card chargeoffs surging” brings up myriad reporting by credible sources, e.g. WSJ. As usual, I look for the Micro effect (my lot) caused by the macro situation. My Capital One Quicksilver Card returns 1.5% annualized cash back on all purchases, which makes using cash or a checkbook losing propositions for me. This card is not offered to sub-prime lenders. There are other card issuers (e.g. USBank) which offer comparable cards, but Cap1 has an extraordiarily easy-to-use website, which credits cash back earned in any amount at any time, with “one-click” convenience. Personally hope Cap1 doesn’t get sunk by its subprime lending. CIti Double Rewards Mastercard gives back 2%, no hassles. At Costco, 4% back on gasoline purchases using Citi. Capital One issues department store credit cards and retail is not doing well. The number I prefer is the per-capita GDP. The establishment doesn’t like this because it accounts for population growth and immigration. The per capita GDP change was -0.05% vs the +0.7% reported without the per capital adjustment. The per capita GDP has been flatlining around 1% per year since ~2009. The economy is not responding to textbook cause-effect relationships, e.g. if automation is causing job losses, then productivity should rise. Productivity has been on a slowly declining path, with a pretty nice upcycle around 2000. Since then it has been declining, as it has been for 50+ years. Productivity (which is measured per labor hour; which has the per capita built in), is the key to economic growth and progress. I need to clarify- the growth in productivity has been declining for 50+ years. Productivity is rising more slowly than it has in the past. Disagree. Just read that the woes of steelworkers can be traced to the fact that it now takes only one man-per-ton for production of steel, whereas it took ten men per ton in the recent past. Oil and gas production, dramatic improvements in per-person well drilling since $100bbl. Does anyone find it curious that the only decent GDP number in the last 10 quarters occurred in the Sept Q and was released just before the election? On the chart it looks like an outlier. Timed pre-election Government Spending boost, common Socialist trick. Thank goodness Millennials are the most responsible and honorable generation this country has ever raised up, and much like the Japanese noblemen of yesteryear would rather commit hari-kari than lose face by defaulting on their debts and obligations. I think you should be aware that most of that millennial debt are the overwhelming student loans they have to pay off. I don’t see too many millennials overspending on crap like name brand clothes, CD’s, movies and other stuff prior generations spent money on. They may spend more on smartphones, but that’s considered an essential part of the lives now since most of them don’t have landline phones and many of them never even had landline phones growing up. In addition, there are a huge percentage living at home. TV set? Parents have one (or, watch on smart phone). Living room furniture? Nope. Even dishwashing soap…parents provide all the peripherals. New bath towels? Curtains? nada. Few clothes as well. No doubt why brick-and-mortar going down rapidly. Parents already have stuff, hunkered down, and sharing with Millennials. My at-home nephew (29) saved $50k in two years from his salary. Will invest in real estate soon. Chasing youngsters out of parents for the misguided sake of “independence” and public shaming has to be the one of the worst U.S societal norms ever created. AFAIK in Asia nobody even bats an eyelid on a thirty-plus year old living with their parents, because the society understandably doesn’t expect 20 year olds to afford a house by themselves, living together also saves a lot of money and both the children and parents can take care of each other. Seems like he needs a good talking to. You wouldn’t be much of an uncle if you didn’t. Personally I’ve persuaded many extended family members and scores of friends to stay out. They thank me frequently. Asians and Samoans in Particular, love those two story 5 + BIG bedroom houses, all with Ensuites. That way 3 generations can live together happily in comfort. So that expensive house actually isn’t expensive for them. It is simply a question of how many sons and their wife’s the grandparents allow to live with them. Sons number 3+ generally have to go and form their own separate unit.